As processing lines become faster and more efficient, the packaging process must be able to cope with the high volume and handle your valuable raw material with the least amount of damage. 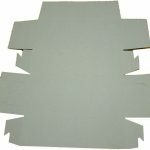 Our carton erectors fold and form open 3-flap retail cartons from pre-cut flat boards with the corners interlocking. 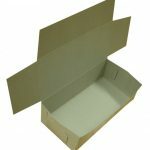 3-flap cartons allow for very easy filling of the product prior to sealing. Also, no glue is used in the erecting process, thus saving production costs. 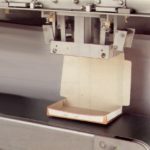 After the food has been placed into the folded carton, it is then fed into a carton sealing machine, which closes and seals the carton using either hot air or hot glue. Each processor usually has his own carton design, and then often a number of different designs. This presents no problem for the carton erectors, since the forming tools in the machine are interchangeable, and can be exchanged in less than 15 minutes. Forming tools are specifically designed for each type of carton and can therefore be ordered separately should new products/carton sizes be developed at a later stage. The machines are built of stainless steel using the latest technology on offer to manufacture the parts and assemble in the shortest and most cost effective manner. Every component is manufactured or sourced locally to ensure the best possible price and back-up service that any production line requires. The machines are very operator friendly and have the necessary safety devises built in to ensure safe operations at all time. The speed of the machines are easily adjustable from a potentiometer on the control panel. The speed in cycles/min is also indicated accurately so it is easy for production staff to fine tune the required throughput. The only required connections are a compressed air supply as well as an electrical supply to be operational.